Apple has their very own Reminders app coming out in iOS 5 with a full tasks, to-do list, shopping list, and reminders functionality built natively into the iPhone and iPad, supported via iCloud sync. The Reminders app looks beautiful and has a comprehensible appearance which might feel too barebones for some, and just right for the casual user. 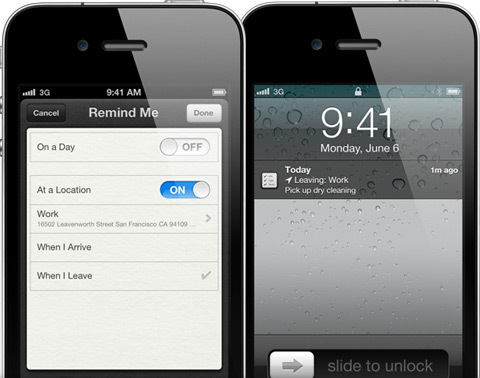 GPS location information will be a key feature of Apple’s Reminders app. You’ll be able to setup reminders tied to a location. For example you could setup a reminder in the app to notify you to pick up dinner when you’re leaving work and are near your favorite restaurant. Thanks to the new notification center in iOS 5, you’ll also be able to view notifications about your reminders on your iPhone Lock Screen. iPhone users have been asking for a reminder app for years and Apple has finally responded. 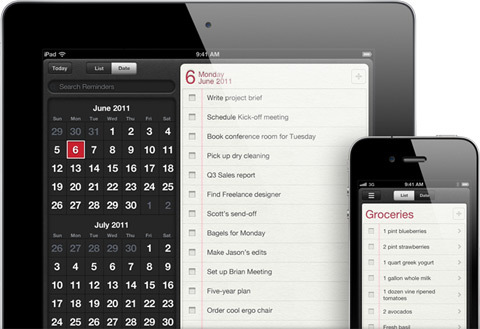 By now there are hundreds of Reminder, To-do and Shopping list apps for the iPhone and iPad in the App Store. Apple’s introduction of a native Reminders app might interfere somewhat with third party developer’s business plans, as the Reminders app not only will be cross device compatible, but will also sync over the new iCloud and get cross-synced instantly with any iOS device, and any computer running iCal and Outlook tied into the iCloud platform. Apps like Todo, Things, OmniFocus, Notificant, Wunderlist, Remember the Milk, and many more are now going to have to differentiate themselves even more to stay competitive to consumers. While the Reminders app does have the ability to store due dates, there is some hope for developers of more sophisticated GTD and project management type apps however. The Reminders app is somewhat limited in features and might not suit people who want finer controls, such as projects, attachments, tags and categories. At the same time developers are now going to offer even further personalization and more innovation is bound to come out of that area. AppSafari review of Reminders was written by Joe Seifi on June 10th, 2011 and categorized under App Store, Notes, Productivity, Reference, Shopping. Page viewed 6949 times, 2 so far today. Need help on using these apps? Please read the Help Page. Hello. It’s was very interest. Thank you. Reminders is a good app.